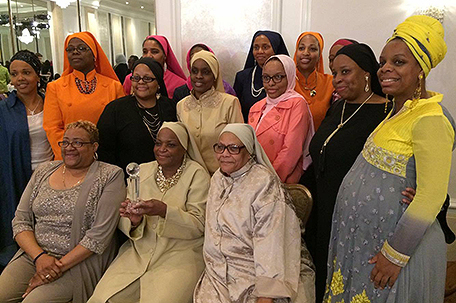 ABOVE PHOTO: Relatives and friends from as far away as Miami came to see Sharon Muhammad (front row, center), owner of Sister Muhammad’s Kitchen on Germantown Avenue, receive the UMM’s Upliftment Award. At the 19th annual United Muslim Masjid Sister’s Recognition and Fashion Show, women got a chance to see that chic is a universal concept. 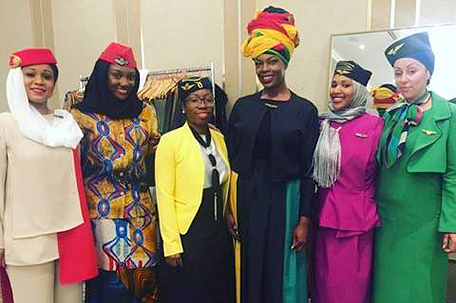 As she sat at a table in the ballroom of the Hilton City Line watching the United Muslim Masjid Sister’s Recognition and Fashion Show, Rukiyah Abdur Rahim of New York took in all the sights and sounds. She watched as models dressed in everything from luxurious floor length furs to athletic wear to outfits that wouldn’t be out of place at an international resort, worked the runway, all while maintaining the standards of modesty set forth by the religion. The image of women enjoying an afternoon of fashion, food and fun isn’t something that’s commonly associated with Islam. Abdur Rahim says it should be. “I came here with a friend of mine,” Abdur Rahim continued. “I’ll come again. 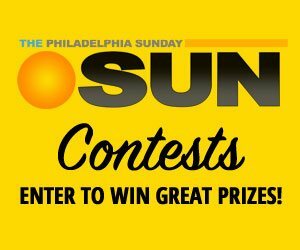 This is the 19th year for the show, which combines high fashion and honors female members of Philadelphia’s Muslim community for their service to mankind. Nineteen years ago, the UMM started doing the show, said Lubna Muhammad, who in addition to being one of the designers featured in this year’s show, was also this year’s event chair. The Flight Attendants of the Flight 19 Global Tour get ready to board their passengers. This group of models represented Dubai, Jamaica, New York, London, Paris and Ghana. Another Masjid had been holding a similar event and when it stopped, a group of women led by Fatimaah Gamble, wife of Rock and Roll Hall of Famer Kenny Gamble, decided to revive it. There weren’t a lot of opportunities for Muslim women to fellowship, so she felt it was important, Gamble said. The event has really taken off, Muhammad said. “We had our first show at the Clef Club on Broad Street, but we quickly outgrew that space,” Muhammad said. The keynote speaker for the event was Dr. Su’ad Abdul-Khabeer, author of the book “Muslim Cool”. While fashion took center stage, the event was also a chance for the UMM to recognize a cross section of women for their business acumen, community service and contributions to fashion. This year’s honorees included: Fashion Heritage award JoAnn Jumannah Davis, whose shop Halal Textiles by Ummi and Sons that sells textiles and gives sewing lessons, Empowerment Award winner Movita Johnson-Harrell, community anti-violence activist and founder of the CHARLES (Creating Healthy Alternatives Results In Less Emotional Suffering), Upliftment Award winner Sharon Muhammad, chef/owner of Sister Muhammad’s Kitchen on Germantown Avenue, Community Service Award winner Majeedah Abdur Rashid, CEO of Nicetown CDC, and Hajjiah Elishabah Taiyibah Mu’minah Shabazz, winner of the organization’s Legacy Award. Once the awards were presented, it was time for the moment everyone had been waiting for: the fashion show. 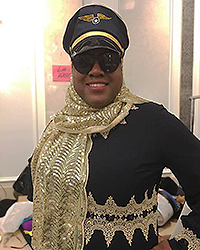 The theme for this year’s fashion show was “Up, Up and Away: Flight 19 Global Tour”, and featured fashions inspired by the global chic that can be found in Paris, London, Ghana, Jamaica, Dubai, and New York. Ushering “passengers” through the World Tour were “Philadelphia Daily News” columnist Aliya Z. Khabir and Yasmine Yasmine, a New York-based celebrity stylist who has styled shows for New York Fashion Week, as well as actors and musicians. Fashions with an eye toward international travel ruled the day as models wearing eye-catching patterns, vibrant colors, and rich fabrics waltzed down the runway. In addition to Lubna Muhammad, designers Gwendolyn Dawan, Anju, (Sanriq Stylz) Latifa Ihsan Ali, (Lia Wear) Netfah Amina-Afia (Simply Netfah), Naima Muhammad (House of Coqueta) and Zinnman Furs, brought their A-games with clothes that would fit in with any woman’s wardrobe. That, Muhammad said, is exactly the point. The fashion show was also a fundraiser for UMM’s Summer Madrassa, which provides educational programming for the organization’s youth.